The weather gods did not play along for Alan Hatherly’s final UCI XCO World Cup race as an U23 rider. The last round of the 2018 World Cup season was hosted in the cold and wet French town of La Bresse, with weather conditions wreaking havoc on both the downhill and cross-country races held over the weekend. Heavy rains and cold temperatures in the day’s leading up to Hatherly’s showdown on Sunday, made for course practice sessions in a proper mud bath: “Trying to plan lines in the mud is always difficult, you have to set up so many options for yourself as the course changes once everyone has had their shot at course practice,” said Hatherly. Hatherly and his Team Spur staff made preparations for racing on a slick course as best they could, opting for Specialized’s Fast Trak tyres to help with mud clearance while providing some extra traction. The rain held off for Sunday’s morning race, but the course remained a slippery mudfest. Hatherly’s usual race-day routine was put under pressure with a last-minute bike change. “As I warmed up on the rollers the gears just weren’t feeling as smooth as I’d have liked,” recalled Hatherly. Team Spur mechanic JP Jacobs did his best to re-align everything but with just 10 minutes to race call-up Hatherly and Jacobs made a call to switch to the training bike. This meant changing race numbers, transponders and correcting the chainring size. A cool-headed Hatherly took it in his stride and didn’t let the pressure shift his focus, but it did impact his pre-race warm-up. “I definitely wasn’t as warmed up as I would have liked. Warming up, then stopping and warming up again meant my legs were a bit heavy on the start line,” he said. “The start loop was chaotic as most of the riders were forced to run sections due to the slipperiness of the off-camber sections,” said Hatherly, who kept his composure through the first tech zone, sitting in the top 10. On the back section of the course however, Hatherly clipped a rock and slashed the tyre’s side wall, and was immediately swamped by chasing riders. A tricky rear-wheel change was handled track side with ease by the capable Jacobs, and Hatherly was back in the game, but had to shift strategies and now play Pac-Man. The mechanical put Hatherly in a battle for positions, rather than able to impose his will on the frontrunners, as he had done in Mont Sainte-Anne just two weeks ago, when he won his first U23 World Cup. Hatherly had rejoined the race in 35th position and knew it would be a hard slog to see how far he could advance up the leaderboard. He kept the pressure to the finish line, salvaging a hard-earned 19th, and the day’s fastest U23 lap time. Hatherly now decamps to Livigno, Italy for a week of training before heading to Lenzerheide in Switzerland for the UCI Mountain Bike World Championships. Hatherly and Team Spur are intent on converting last year’s second place at teh World Champs in Cairns, Australia to the coveted rainbow jersey. 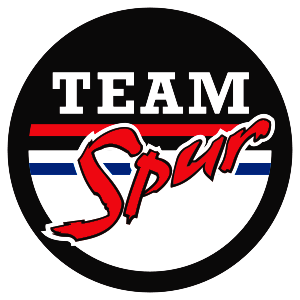 Hatherly races on Friday, 7 September and Team Spur will again be covering the pulsating racing action on twitter (https://twitter.com/team_spur) .